I think I have already mentioned in one my previous blogs that I LOVE Historical fiction. If it’s a historical romance, even better (Oh! Come on! I am a girl after all!!). So when I decided to write this post I thought I would do a quick survey of some of the top historical romances before getting down to the particulars. Unfortunately, the moment I Googled, I realized that my understanding of a historical romance and that of the world at large is very different. To give an example of the same, Amazon list of top 25 romances consists of innumerable Judith McNaught and Jude Deveraux novels. While both the writer are very talented and I myself when I was somewhere in between the age of 15-20 have devoured all Ms McNaught ever wrote, one must admit in all honesty, that these are romances with no history. They are love stories set in a forgone period which adds all the dash and glamour of the bygone era to the story. So what is my idea of a historical romance?…..Have you read a book perhaps little known called “Shadow of the Moon” by MM Kaye? Ms Kaye was born in colonial India in 1908 and spent her early childhood and much of her early married life in the same country. Born into a family that for generations had served the British Raj, her love for the country and her people was clear in her writings. 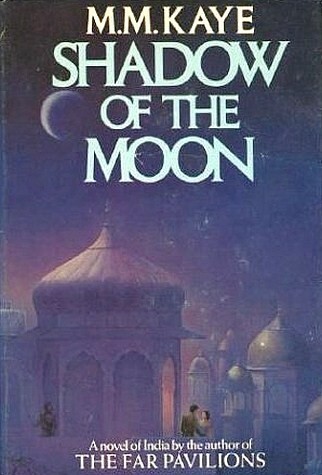 Though after India’s independence, she would travel the world with her husband, Major-General Goff Hamilton of Queen Victoria‘s Own Corps of Guides and write about those places including, Cyprus, Berlin, Zanzibar, her heart would always hold a special place for her adopted nation, and from this came her most successful works – Shadow of the Moon 1957, revised in 1979 and The Far Pavilions 1978. Shadow of the Moon is set in India during 1856-1858, tracing the rise and fall of the Indian Sepoy Mutiny. Being the daughter of the land and the great-niece of Sir John Kaye, who wrote the first standard account of the Indian Mutiny, her book is an exact and empathetic description of two races and nations striving to do what they believe is right, (though the author’s sympathies are clearly with the conquered race than the conquers!) without completely understanding the other’s view leading to one of the most horrific rebellions in the annals of British-India history. The book captures the politics, customs and economics that went into the making of the Indian mutiny, besides vividly portraying the characters of some of the greats of history who were instrumental in the event Lord Canning, Sir Henry Lawrence, Major William Hodson etc. The books gives a moving account of India with the heat, the bazaars, the winding rivers, the small hamlets, the acres and acres of cultivated land and her British India society with its balls, social rituals and moonlight picnics! At the heart of the book however is the heart warming love story of Winter de Ballesteros and Captain Alex Randall. Winter, the orphaned daughter of an English aristocratic mother and a Spanish nobleman, sets off from England to marry Conway Barton, whom she was betrothed to as a child. Alex Randall, Barton’s junior and an officer of the British Army, who is now working as an administrator in the fictional town of Lunjore, whose Commissioner is Barton, has been tasked to bring Winter to Lunjore. Winter’s journey to India, her marriage to Conway Barton, her flight during the Mutiny and finally uniting with Alex Randall makes the core of the story around which the politics, the battles and the history of India play out. While it sounds sordid, the love story is anything but so…it’s tender, moving and completely accurate in terms of social observances of the era. The country, her people and her heroes leap from the book and come alive as they grab your attention and force you to imagine an era long gone, in a land far away and love story that reverberates across time! What so special about the book – it’s a darn good yarn. While the love story plays out, the book also has enough suspense, intrigue and thrills, to make it a good read. These along with the vivid and lyrical description of the land and her customs, makes the novel an all-round winner that would satisfy any genre of readers – romance, descriptive, thriller, historical!!! Read it…I guarantee that you will at the least enjoy it if not love it!! You have so made me want to read this!!! I just added it to the “to read list” 🙂 🙂 Thanks!!!! Historical fiction is awesome. Oh!! I so glad to on-board the uninitiated to this book….I love historical fiction and when its a romance…well I am all for sensitive mush…do let me know how you liked the book! 🙂 The pleasure is all mine! !